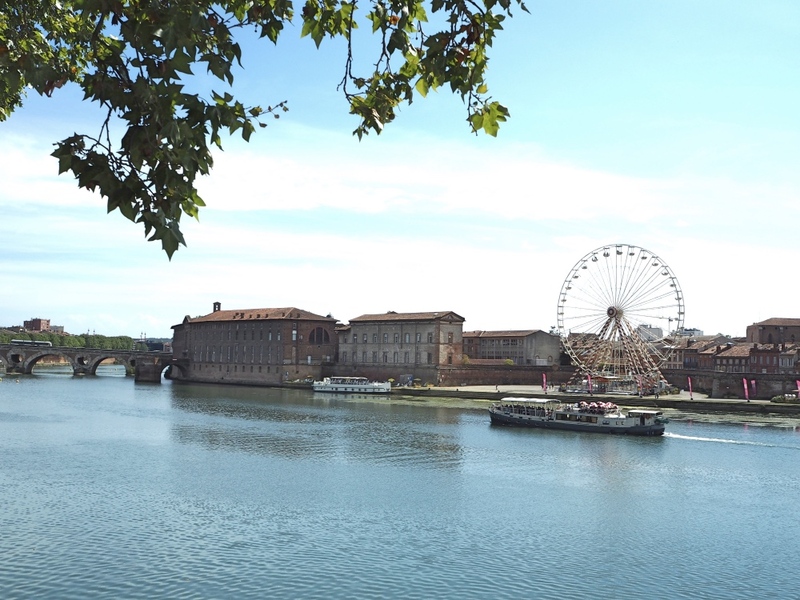 Recently we briefly visited Toulouse to catch up with family. We knew that we wouldn’t have enough time to see much of the city but we were still keen to spend a couple of hours checking out its main attractions. 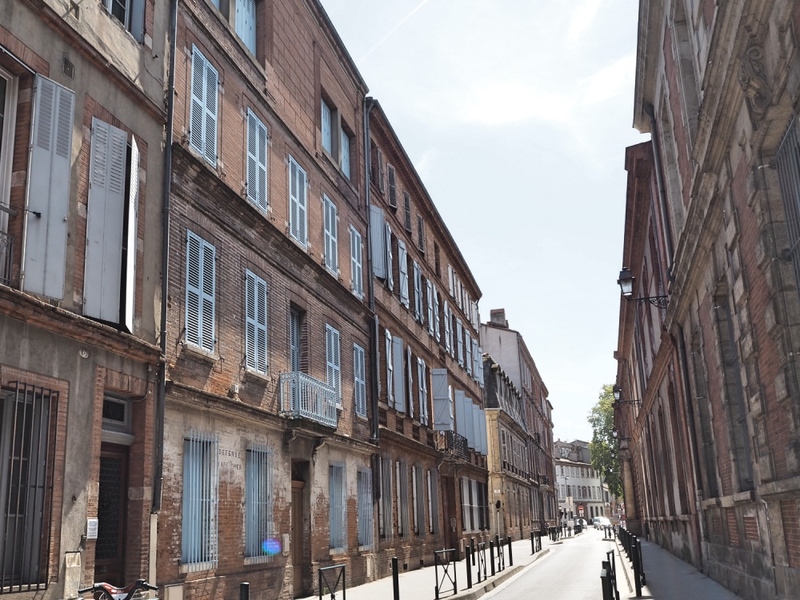 Toulouse is a lovely city to walk around, especially on a nice summer day. The locals call it “la ville rose” (the Pink City) because of the pink stones used in many of the buildings within its old town. Walking around the Pink City! 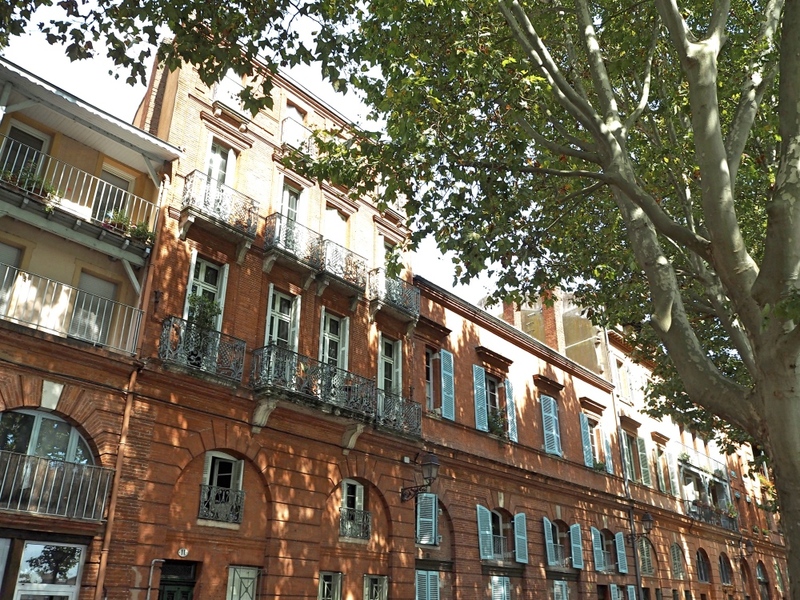 La Place du Capitole is the main square of Toulouse and is located in the heart of the city. It’s a good starting point for any walking tour. The Capitole which dominates the east side of the square is the current City Hall (Hôtel de Ville). It is also the home of the National Theatre and the opera house. It is a very imposing building with eight pink marble columns on its façade. If you have time you should enter the Capitole to check out the “Salle des Illustres”, a hall with an amazingly ornate ceiling and walls covered in beautiful paintings. The entrance is free too! 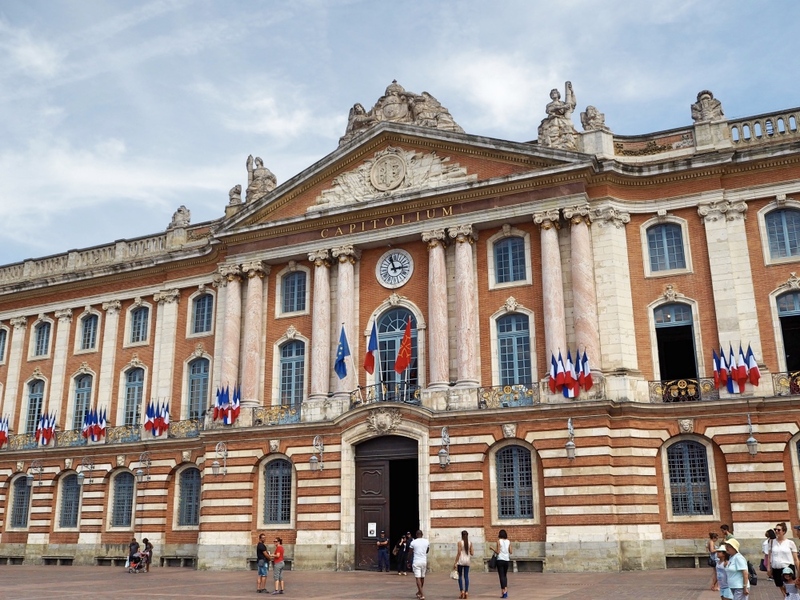 The Capitole, Toulouse’s City Hall. 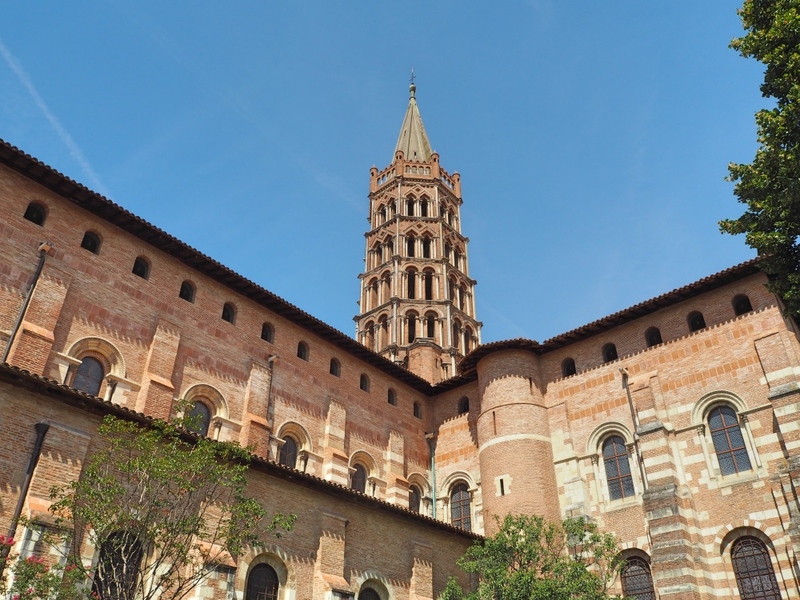 From the Capitole Square walking down the Rue du Taur on the north-west corner will lead you to Toulouse’s imposing Basilique St-Serrnin. 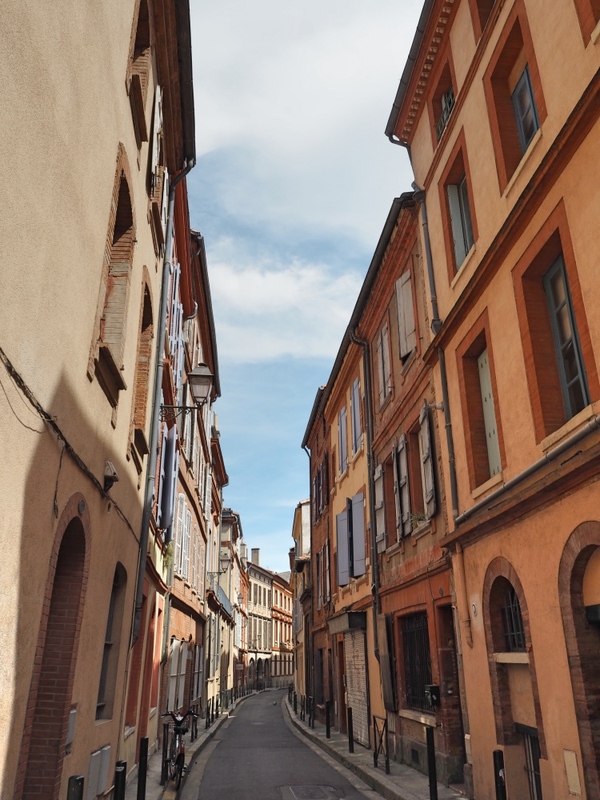 In the Middle Ages, the Rue du Taur was one of the most important shopping streets. Today it is a pedestrian mall lined with interesting buildings, shops and a few restaurants. Most of the buildings on this street have those famous pink stone walls for which the city is known. 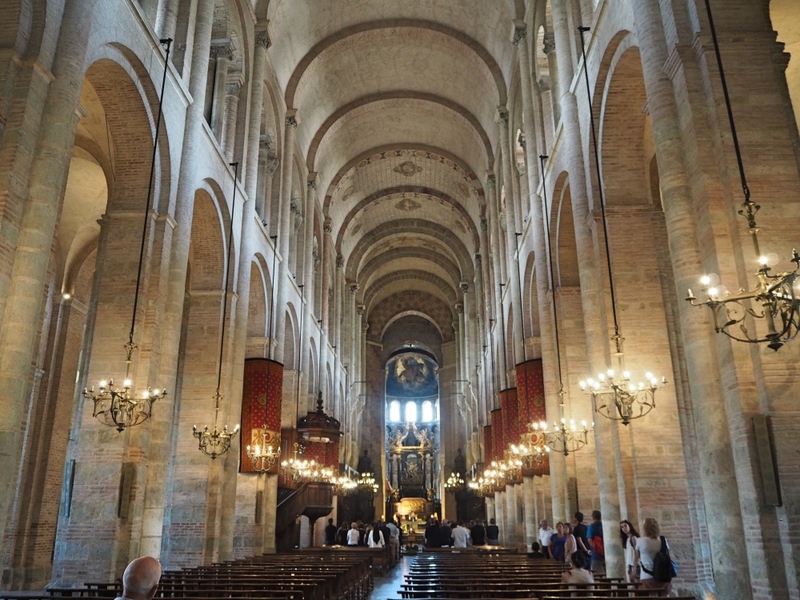 You will also find the Notre-Dame-du-Taur, a church that dates from the fourteenth century. 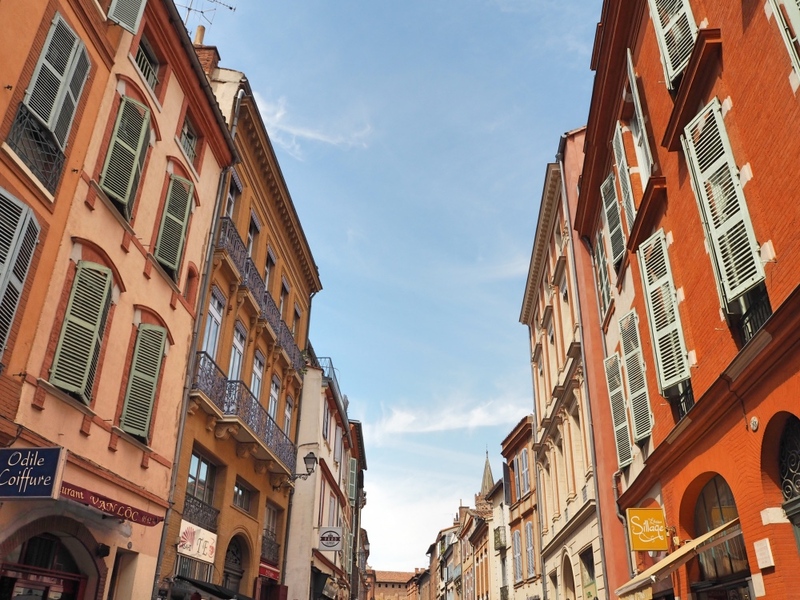 Rue du Taur remains one of the most important shopping precincts in Toulouse. Walking down the Rue de Taur towards the Basilique St-Sernin. 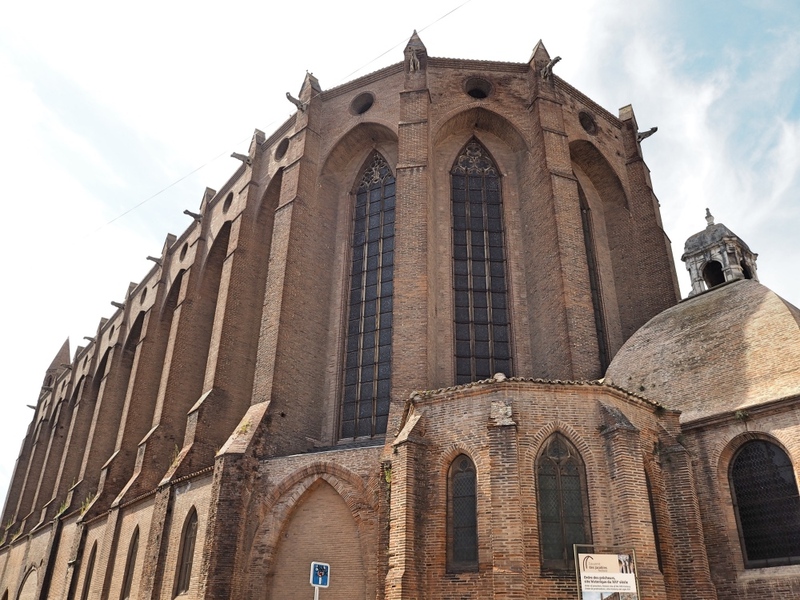 The Basilique St-Sernin is Toulouse’s most famous church and one of its oldest. It was classified as a UNESCO World Heritage Site in 1998. 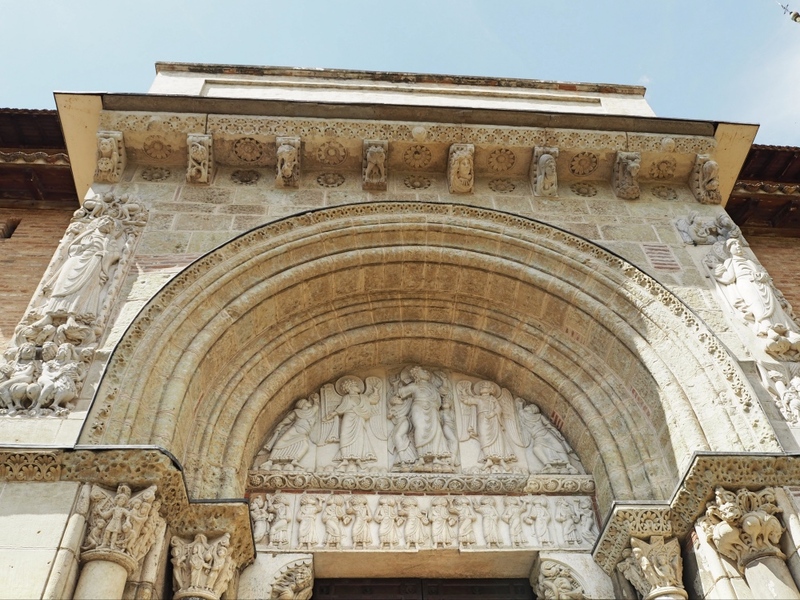 Built in a romanesque style in the 11th century, it is a true architectural masterpiece. Its exterior is impressive with its most prominent features being its bell tower and the beautifully carved Porte des Miégeville. Because of its size and the height of the bell tower the Basilique can be seen from all around the city. Although its interior is very simple compared to its exterior, it is still worth going inside for a look. Try and go during a service to hear the sound of the grand organ! 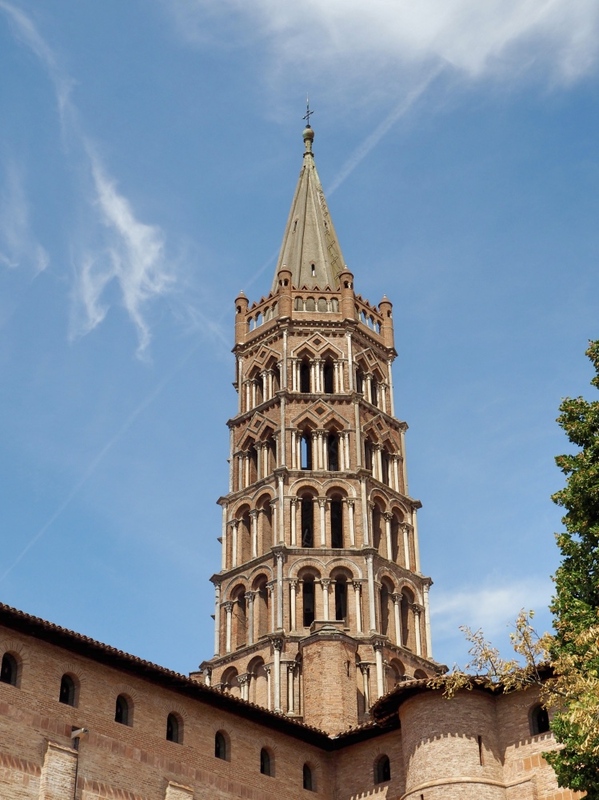 The bell tower of the Basilique St-Sernin. The entrance “Porte des Miégeville” of the Basilique St-Sernin. A side view of the Basilique. This much smaller church is not as popular as the Basilique, but we were pleasantly surprised by the beauty of its interior. From the outside, it is difficult to find. It is surrounded by other buildings and all you can see is a plain wooden entrance door. As you pass through that door though you will find the church at the end of a vast vestibule. It is just stunning! We could have spent hours admiring those beautifully detailed marble ceilings. The masterpiece is its impressive dome. Your neck will strain as you stare up and admire it! It’s hard to appreciate the number of hours that it would have taken to create all of its beautifully detailed carvings. 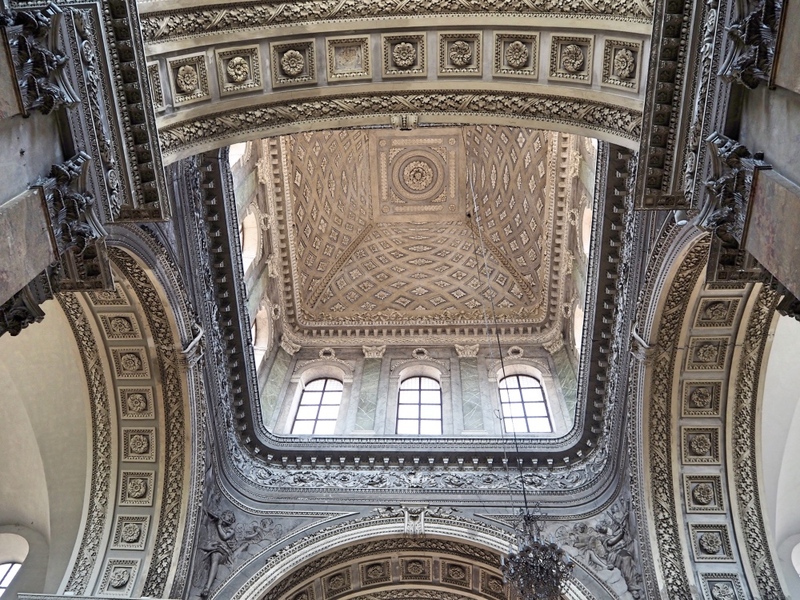 The impressive Dome of the Church of Saint-Pierre des Chartreux. 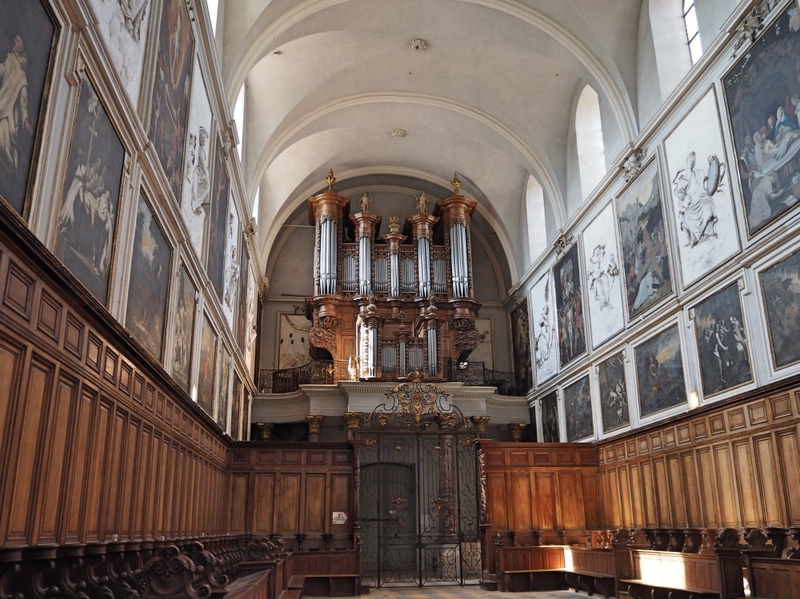 The many paintings and the organ inside the small church. 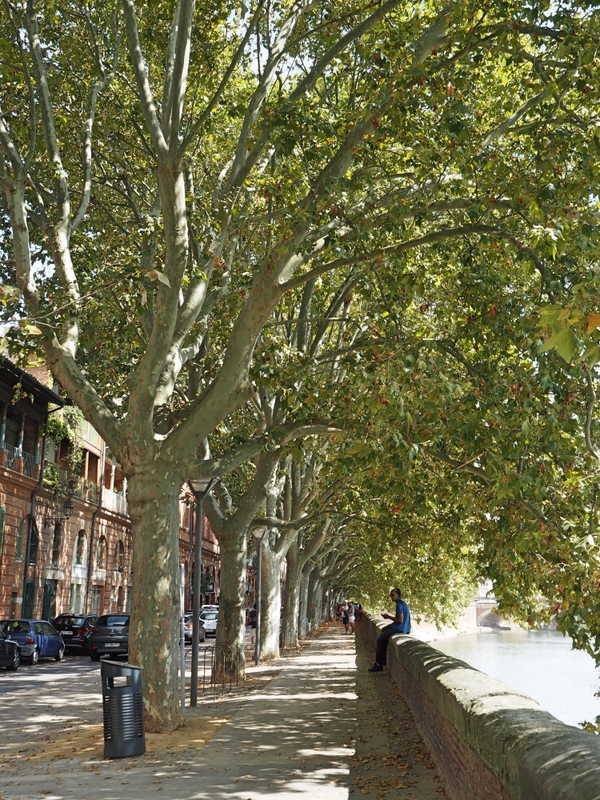 A walk by the Garonne river that flows through Toulouse is a must! We walked from the Pont St- Pierre to the famous Pont-Neuf on the Promenade Henri Martin. From that promenade, we took in beautiful views over the river and totally fell in love with that part of town. Although we don’t plan to move back to France anytime soon, if we ever did then this is where we’d like to live. Of course, with such a beautiful view over the river, we suspect the residences there might be a little out of our price range! There is no harm in dreaming though! If you have time, go on one of the small boat tours for an hour of cruising along the river. The Pont St-Pierre and the Garonne river. Cute residences on the promenade Henri-Martin. The view across the river from the promenade. A lovely tree-lined walk along the promenade. Although this convent looks nothing special from the outside, you should step inside to check out its breathtaking ceiling. As you enter you will be in awe of its soaring ceilings and beautiful stained glass. You will find yourself continually looking up! The entrance to the main church is free, but if you have time pay the four euros to visit to the adjoining Cloisters; they are magnificent. The outside of the Couvent des Jacobins. 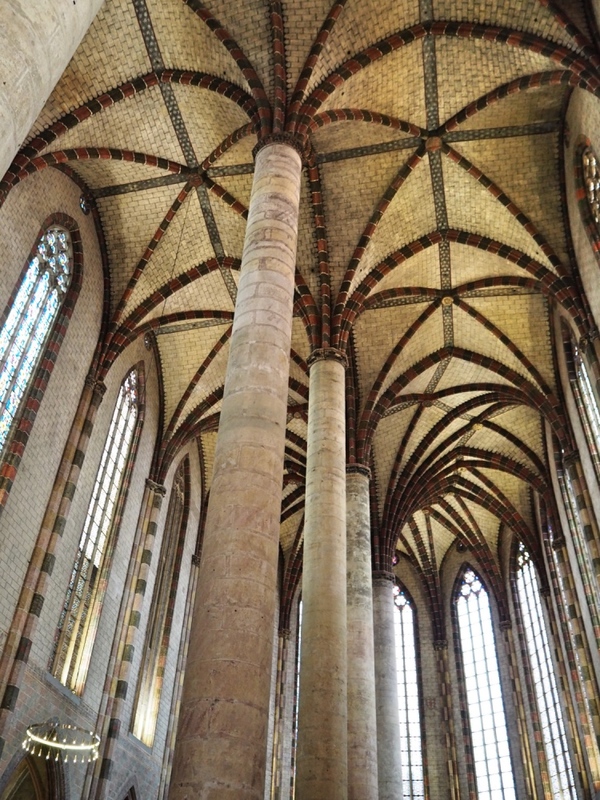 The impressive ceiling of the Couvent des Jacobins. Even though it was not long enough, we really enjoyed our time in Toulouse and would love to see more of it in the future. 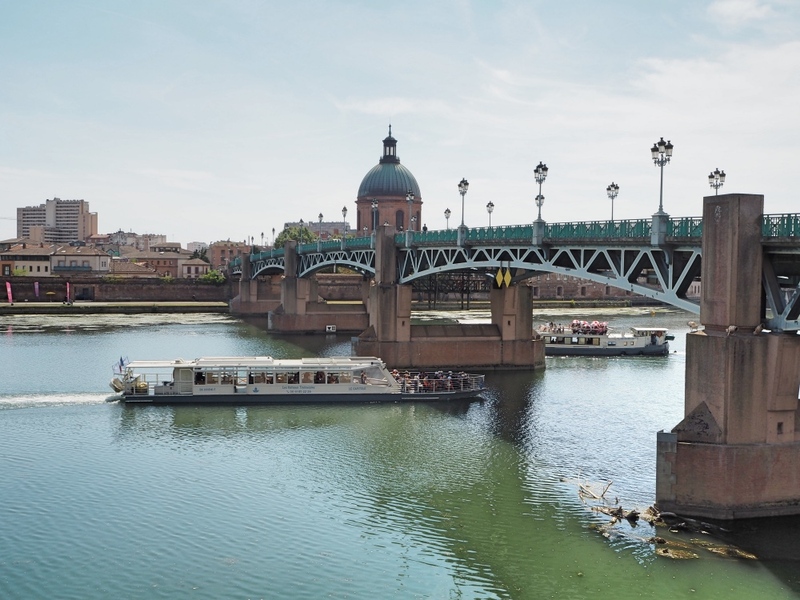 Toulouse is not a particularly touristy city and it only receives a fraction of the tourism of Paris or Nice. Even on a warm summer day, we didn’t feel like the place was overly crowded. That made it such a lovely place to wander around. So on your next trip to France, pay Toulouse a visit. You won’t regret it! Toulouse is a great city to walk around; barely any tourists! hi, I will be in Toulouse from 21st March noon until Sunday 24th noon… Are you having tours during these days? I understand this are free tours, meaning.. there´s not a standard price but tips. I usually take this kind of tours. I´m not able to find the schedule and location from where it starts. Can you give me more info please? Hi Susan, the tour we describe on our blog was a non guided walking your which we followed ourself from a map given at the Information Centre. Enjoy Toulouse, it’s a great city.